This concert included a special Hanya Holm piece not done for half a century, "Ozark Suite." Holmes' choreography was re-constructed by Paul Chambers and the piece was video taped as part of the permanent dance collection at the New York Library for the Performing Arts at Lincoln Center and will be added to the Hanya Holm Dance Archive for public viewing and for dance research. WHDT would like to thank Paul Chambers for generously offering "Ozark Suite" to the company. Mr. Chambers performed this work with the Hanya Holm Company in 1957, 1958 and 1959. Paul is the only company member remaining who has danced this historic work and WHDT is the only dance company performing the work today. To preserve this historically significant master work, WHDT in connection with Paul Chambers is filming "Ozark Suite" and an archival copy of this master work is being presented to the New York Library for the Performing Arts at Lincoln Center at the request of the Hanya Holm Foundation. The film will be part of the permanent dance collection and will be added to the Hanya Holm Dance Archive for public viewing and for dance research. The filming of "Ozark Suite" is generously sponsored by Norman and Elain Polsky. 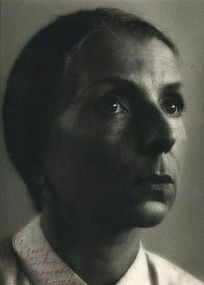 1948 Portrait of Hanya Holm (1893 – 1992) by Marshall Brooks. She was a dancer, choreographer teacher and one of the pioneers of modern dance. Holm is considered one of the "Big Four" founders of American modern dance along with Martha Graham, Doris Humphrey and Charles Wiedman. In Her native Germany Hanya Holm as a student of and an instructor for Mary Wigman at the Wigman School in Dresden. In 1931 Holm came to New York where she founded the Wigman School of Dance. In 1936, with the growth of nazism in Germany the school became the Hanya Holm Studio. Holm's 1948 Labanotation score for Kiss Me, Kate, was the first copyrighted choreography in the United States. 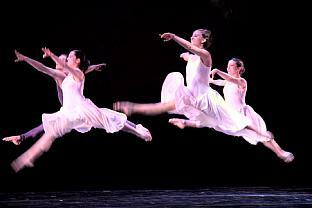 Metropolitan Daily was the first modern dance composition televised on NBC. From 1941 until 1983 Holm ran the summer dance program at Colorado College. Paul Chambers died September 29, 2005 at age 80 at his home in St. Joseph, Missouri. His death was unexpected. 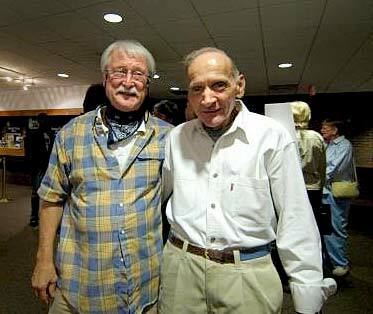 Paul is on the right in this photo taken during the Fall 2005 dance concert of Wylliams/Henry Danse Theatre, just a few weeks before his death. Here he is with longtime friend Dan DeMott (left) in the lobby of the Performing Arts Center just outside White Recital Hall on UMKC. "Obsession" was created for the International Ballet Project as part of Inside/Out Dance Series at Jacob's Pillow Dance Festival. This website has marvelous photos. Your dancers are magnificantly talented.